Terming demonetisation and Goods and Services Tax (GST) as "two historic decisions" of the Narendra Modi government, Union Minister Nitin Gadkari on Monday said the revenue receipt will rise to Rs 30 lakh crore in the coming years. Participating in India TV's 'Samvaad' programme, the Road Transport, Highways and Shipping Minister said that the Modi government's decision to demonetise the Rs 500 and 1,000 currency notes had contributed Rs 7 lakh crore growth in revenue. "When we formed the government, the revenue receipt was Rs 13 lakh crore. Now the revenue receipt is Rs 20 lakh crore. Demonetisation majorly contributed in this growth of Rs 7 lakh crore. I am sure GST will also contribute in this," he said. About road construction and other development related programmes, Gadkari said the pace of road construction under the NDA regime till March this year has reached at an average of 23 km per day. The government has constructed 16,800 km of roads in the past one year, he added. Gadkari also mentioned the overnment developing river traffic control system on the lines of air traffic control between Haldia (West Bengal) and Patna (Bihar). "The project (of river traffic control) will be launched soon," he said, adding that work on Rs 4,000 crore project between Haldia and Varanasi was already on. Gadkari announced that five star and seven star cruise services would also be started in Ganga river. He also promised to work on Delhi's traffic woes and rising air pollution, saying that by August this year, the city's traffic problems will be reduced by half. The minister said that he was considering a proposal to construct a flyway between Dhaula Kuan in Delhi and Manesar in Gurugram. 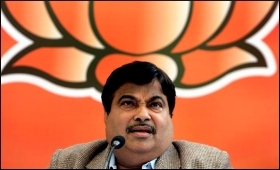 Gadkari also rubbished reports of Prime Minister Modi interfering in functioning of other ministries and said that he had, on many occasions, sought help of Modi and Finance Minister Arun Jaitley.